Coatis are funny mammals with small rounded ears who we sometimes see around our school. They are diurnal and walk in groups. 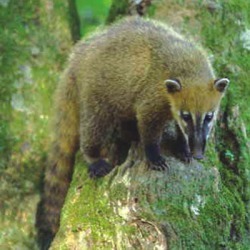 Coatis are tree dwellers but also also found on the floor. Their strong and powerful feet and yellow-ringed tail facilitates their search for food, like small invertebrates and fruits that fall on the ground. Even though we don't see them as often, their feces are frequently spread around the school's buildings.Coatis are found in South America and parts of southern North America, however, the only species found in Brazil is Nasua nasua.